Our first Muffin Tin Monday in March, and we're celebrating with shamrocks and rainbows again. A cheese (and sneaky spinach - mom's been at it again!) rainbow quesadilla (I used food writers to draw the rainbow). A pot of gold beneath the rainbow in the form of yellow rice. A skewer of fruit (cantaloupe, honeydew melon, pineapple), salsa for dipping, and a skewer of olives. Pierce ate everything but a few bites of the rice. Please stop by to enter my spring giveaway for a cedar bluebird house and a squirrel proof bird feeder! I love your tin. The 3-d rainbow is so cool. Great idea and so much fun! I love the rainbow! Very creative. I want those food safe markers so badly! Love the rainbow Lisa! Your tin is so cute! Happy monday my dear! what a great idea! 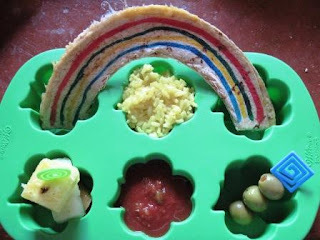 I love the rainbow...I think my little boys would love that too. I need to find some food writers! Great rainbow! Clever idea for the "pot of gold!" Love it! That rainbow is so cool! You had me Lisa! I kept trying to figure out what in the world you used to make the rainbow before I read your post. I couldn't figure it out at all! lol Now that is really cute! My kids would have loved the fruit and would have wanted to eat the entire melon! They love their fruit. I LOVE Muffin Tin Monday!! I have got to get some of those food writers, they're just too cool! How do you come up with the ideas for this? How fun! Isn't it amazing what you can get kids to eat if it only looks fun? I once made my daughter green scrambled eggs after reading Dr. Seuss' "Green Eggs and Ham" to her when she was little and she ate every bite! I don't know why but these muffin tin posts intrigue me. I really enjoy them. I love the rainbow quesadilla! I think the muffin tin lunches are so cute. I just can't bring my self to buy 4 of each to be able to do it with my kiddos. Maybe if I find some cute ones on clearance some time. that muffin tin is great! and the foods look delicious...great ideas! Very creative lunch! I love the way you did the quesadilla rainbow. Ooo I love this one! I've never heard of food writers. At first I had no clue how you made the rainbow. That rainbow is the cutest thing ever! You are way too artsy, I'd never be able to think of those great things! I love it! TOO adorable!!! this looks so yummy and is so cute, too! we're doing a rainbow theme for the girls' bday in april and this really caught my eye!